During her practice, Khun Mae had always had strong resillence and determination. Once, during her meditation from night to dawn, she knew that many people do not have that kind of resillence and endurance to meditate for hours at the time. Then she saw- the in-breath and out-breath. Just by consistently practicing the in-breath and out-breath, one would be able to achieve very good results. To let go and relax till the heart is nimble (like a 3 year old child) and then the heart would be peaceful. Khun Mae tried to practice the in-breath and out-breath and find that it is easy to calm the mind. It is something that she could teach others to do so that they could also benefit from meditation. It is best to find a single method of practice and stick to it with loyalty. Have faith and preserverance to do it till one succeed. Some people may keep changing their method when each teacher they meet teaches them different methods. Practice in-breath and out-breath till one’s heart calm down. Then look within the body. This method suits most people’s temperament. Do not let the mind move out towards any vision/ voice/light. This delay one’s practice and may cause one to move towards the wrong and harmful direction. Khun Mae herself experimented with the in-breath and out-breath practice method and know this method is very effective. That is how she could built a temple (as off 2014 she has 3 temples under her and she is very hands on throughout the entire process) without feeling tired. Start by breathing in and out strongly and take note of the breath. Throughout the day while performing daily tasks….be very conscious of the in and out breath. Don’t wait and prospone it till night time….by telling ourselves we would take time to meditate when we get home or before we go to sleep. Often, one would not be able to keep to it as one may be too tired or distracted. Be conscious of the in and out breath throughout the day. If you forget- go back to the breath again and again. When the day is tough, let go, let go…. always returning to the breath. 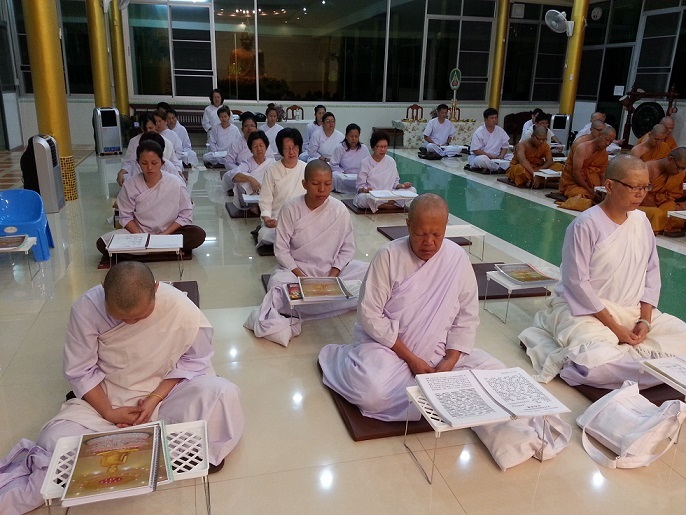 When we have been practicing the entire day, the mind would be able to settle down very fast. Whereas, if the mind had been distracted, not mindful and stressed out the entire day, it is hard to expect one’s mind to calm down, relax and let go. Always make our hearts smile. Then whenever others make us upset or angry, our heart is smiling and peaceful all the time. Whenever we get angry and upset at others (taking things personally), it indicates that our sati (mindfulness) is not sufficient and hence we could not be aware and let go of our emotions. Perform the results consistently for one month and one would be able to see results. At the end of each night before we sleep, meditate for a short while and transfer merits. If we try to transfer merits to a person who is bad or unkind by performing dana (donations)- it would not be much use and the merits would not be able to reach the person. But if we perform chanting and meditation, following by transferring merits to the person’s guardian devas and kammic debtors (beings who the person had wronged and possibly obstructing the person)- it would reach its intended recipients. At first the practice would not be easy. Don’t just assume that we do not have the ‘parami’ or past merits/ cultivations and hence we were not able to chant or meditate successfully. If we do that, we are the ones obstructing our own self. If indeed it is true that we do not have any paramis, we would not be born as a human being in the first place. Even a person who is born without sight or limbs- through perseverance ….could earn a living with right livelihood. Hence, why are we making excuses for ourselves or giving up at the slightest challenge? Many things in life may not give us any certainty. People around us may change, we may lose what we’ve had or our health may one day suffer. But one thing is for sure- when we leave this world we take nothing with us except our merits and kamma. Don’t give up- start by spending short while in meditation and chanting- 5, 10, 15 minutes. Have faith and continue going for sometime and when the heart experience solace, peace and calmness with the practice- we would automatically extend the time and progress further and further. As we continue, the heart would find refuge in times of trouble. With the heart calmed by mindfulness, solutions to problems would arise. When affected by setbacks in life, ie loss, defame, suffering, ill health- the heart would not be disturbed or affected.